(Nanowerk News) Nanomedicine is the medical application of nanotechnology, or the use of microscopic structures to diagnose, image, treat and prevent disease. Current problems in nanomedicine include understanding and anticipating the potentially toxic impact these nanostructures have on the body and the environment once they're released. Kattesh Katti, a researcher at the University of Missouri, is developing nano-scale molecules, including gold nanoparticles and other "green" technologies, to image and treat diseases such as cancer, Parkinson's disease, arthritis and degeneration of the eye--all while curtailing the impact these structures sometimes have on the body and environment. Kattesh Katti For distinguished contributions to the fields of chemistry, radiopharmaceutical sciences, green nanotechnology and nanomedicine, Katti has been chosen for induction as a Fellow of the National Academy of Inventors (NAI). Election as an NAI Fellow is a high professional distinction accorded to academic inventors who have demonstrated a highly prolific spirit of innovation in creating or facilitating outstanding inventions that have made a tangible impact on quality of life, economic development, and the welfare of society. 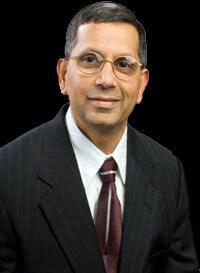 "I am thrilled to be elected into this prestigious fellowship of the National Academy of Inventors," Katti said. "It is particularly gratifying that I am joining the august group of outstanding NAI fellows along with another great Mizzou colleague who is also being inducted. Election into NAI is a clear reflection of our outstanding quality of discovery research here at MU as our academic approach is embedded with inventions and entrepreneurship. I am indebted to all my teachers, collaborators, post-doctoral fellows and students because this success is a culmination of our collective painstaking efforts. I thank my wife Kavita, our children and my parents for all their support throughout my professional life." Katti, Curators Professor of Radiology and Physics in the School of Medicine and the College of Arts and Science and senior research scientist at the University of Missouri Research Reactor (MURR), pioneered the development of several nanomedicine tools used in hospitals worldwide. Cancer specialists treating prostate cancer with gold nanoparticles, for instance, often were limited to using high doses of toxic chemotherapy. Katti and other researchers at MU found a more efficient way of targeting prostate tumors by using gold nanoparticles and a compound found in tea leaves. When combined through methods he developed, this treatment can be used in much smaller doses and travels through the body without inflicting damage to healthy areas. Katti's work in developing green nanotechnology includes the use of common spices and plants to target, image and treat ailments. The usual method of creating gold nanoparticles utilizes harmful chemicals and acids that are not environmentally safe and contain toxic impurities. Katti helped develop the method that scientists use to mix gold salts with cinnamon and stir the mixture with water to synthesize gold nanoparticles. These green therapies are less toxic to the body and could provide alternatives to current treatments like chemotherapy and radiation which have negative side effects. "As a professor of journalism, I can see how Kattesh's inventions will reach both our students and society at large," said Randall D. Smith, professor and Donald W. Reynolds Endowed Chair of Business Journalism in the Reynolds Journalism Institute at MU. "His approach to academic enterprise stands as a role model on how academicians, regardless of their discipline, should embrace inventions and entrepreneurial philosophy in teaching and research." Katti holds a doctorate in inorganic chemistry from the Indian Institute of Science. He was selected as "One of 25 Most Influential Scientists in Molecular Imaging in the World" by rt Image in recognition of his pioneering work on the utility of gold nanoparticles in imaging and therapy. Nobel Laureate Norman Borlaug cited Katti as the "Father of Green Nanotechnology" in recognition of his groundbreaking green nanotechnology invention of producing gold nanoparticles by simple mixing of soy beans with gold salt. Katti was inducted as a Fellow of the American Association for the Advancement of Science (AAAS) and is a Fellow of the St. Louis Academy of Science. His green nanotechnology discovery using cinnamon-phytochemicals in the mediated production of gold nanoparticles was selected as "one of the 10 best inventions of 2010" by BioresearchOnline.com. "Working with professor Katti for more than three years has been the most productive stint in my academic career," said Ravi Shukla, research fellow of applied sciences at RMIT University in Melbourne, Australia. "I was able to witness firsthand the innovative and inventive approach Dr. Katti practices in his research. His ground- breaking publication in the Journal of the American Chemical Society where he discussed his discovery of phosphine-aminoacid conjugates--popularly referred to as Katti peptides--has been a game changer in nanotechnology for the development of biocompatible nanoparticles for use in a plethora of biomedical and electronics and materials science."